The Fokker F28 Fellowship was one of the first multi-national aerospace programmes being a joint venture beteen Fokker, MBB and Fokker VFW of West Germany and Shorts Brothers of Northern Ireland. First announced in 1962 the resulting F28 was probably the first small jet that could truly be called a regional jet. Although it did compete against the BAC One-Eleven in some markets the One-Eleven was clearly aimed at full service airlines and was not a true regional aircraft. The resulting design of the F28, although sharing the t-tail, rear mounted engine configuration of the One-eleven and DC-9, had several novel features of its own, such as a 5 section lift-dumper and split tail-cone airbrake. The F28-1000 first flew on May 9, 1967 and entered service with Braathens SAFE on March 28, 1969. There were several developments of the basic F28 version. The initial series 1000 seated 65 passengers with a fuselage length of 27.4m. The F28-2000 was stretched by 2.21m to seat up to 79. Only ten were built. The F28-3000 was an updated version of the series 1000, whilst the series F28-4000 represented the epitome of initial F28 development. The series 4000 had the longer fuselage of the series 2000 but uprated engines and a wingspan increased by 1.57m. The F28-4000 sold well and represented 112 of the orders for the type (nearly 50%). Further developments of the F28 were mooted but only the F28-6000 ever flew. This was basically a series 4000 with slats added. 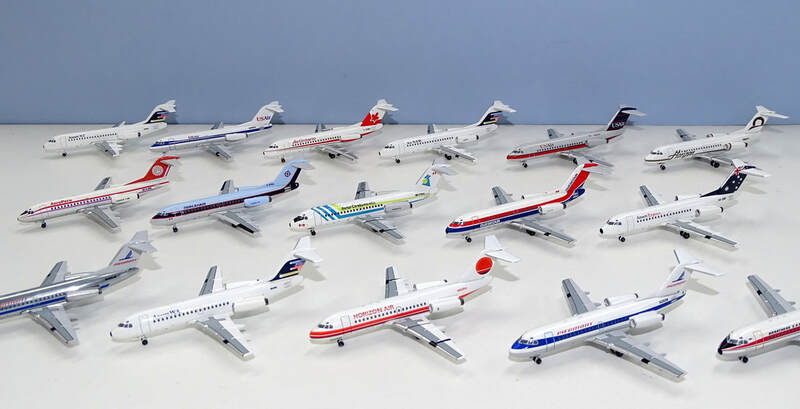 In total 241 F28s were built, making the type a decent seller for the era and obviously it was developed into the successful Fokker 100 series. The Fokker 100 was a successful update to the F28 which first flew in November 1986. It featured new Rolls-Royce Tay engines, a new wing and an obvious fuselage stretch giving a maximum passenger load of 107. The F100 sold very well eliciting large orders from both American and USAir however it wasn't enough to save Fokker and production ended in 1997 with 283 made. The Fokker 70 was a version of the F100 with over 4.5 metres of the fuselage removed giving a maximum seating capacity of 80. It first flew in April 1993 however only 47 were completed prior to Fokker's untimely bankruptcy. Both the F100 and F70 have continued in service in large numbers into the 2010s. There is only one mould in 1/400 scale - by Aeroclassics. The wingspan difference between the 1000-3000 and the 4000-6000 amounts to only 0.4cm in 1:400 scale (5.89:6.27cm) and so is not very noticeable, however the fuselage difference between the 1000 and the other versions is more noticeable (6.85:7.40) at 0.6cm. It isn't a lot but when you see a series 1000 against a series 4000 you can easily tell the difference. Aeroclassics mould represents an F28-1000. The mould itself dates from 2007 when Aeroclassics made a rather random (and small) selection of 8 F28s. These included such well known airlines as Pelita Air and Aero Continente (in fact all but one were either from Indonesia or South America) so I can't think why they might not have sold well. In all seriousness I'm all for obscure airlines being made, however considering the F28s wide usage it seems perverse not to have chosen any US or European examples. The mould then vanished into hibernation until 2014 and I am very pleased to see that since a selection of 36 further F28s has been made making by 2019 a grand total of 44 releases. Seven of the more recent releases have been from the USA although clearly Aeroclassics is a little hamstrung by not having an F28-4000 mould, which would enable it to do a variety of Altair, Empire Airlines and Piedmont/USAir versions. Usually series 4000 examples on the 1000 series mould are avoided, although not always. Australian (7) and Canadian (14) are quite well represented, but both are still missing important operators (MMA and Transair for example). Europe remains heavily under-represented with only 4 examples to date (only one of which is of an early operator). There is clearly a wide number of F28s that can still be made for some very well known airlines. Aeroclassics move in mysterious ways so who knows if we'll see them in the future? We can only hope. The mould isn't bad although it isn't perfect either. The vertical stabiliser and engines look good as do the wings. I'm less pleased with the fuselage line under the horizontal stabiliser and the tailcone airbrake. The top line is angled, not straight and the airbrake too rounded at the top. There is a seam at the wing fuselage join, which damages the join shape at the front but this is forgiveable. Moving towards the front and in detail the mould continues to rather disappoint. The undercarriage is too long and the nose shape is not perfect (I think it's a little too short and round) but is a decent representation. Altogether the mould looks like an F28 but isn't amongst Aeroclassics best work. I find myself in the familiar situation where I am happy that Aeroclassics have made a relatively obscure type but less happy about how they've used it and the models they've made. C'est la vie I guess. Personally I rather like them despite their failings. Only 7 F70s have been made. The first was marketed under the Blue Box name whilst the remainder have been split between JC Wings (2) and Gemini Jets (4). KLM Cityhopper has featured three times in the current releases. The mould is superb so its a shame that there hasn't been greater use of it. Despite the limited production run there is plenty of scope for further releases. Another great if under-used mould. 17 F100s have been made 1 by Blue Box, 10 by JC Wings, 1 by JC Wings for DreamAir of Taiwan and only 5 by Gemini. The mould captures the look of the type really well though Gemini have had a tendency to misprint the position of the cockpit windows on both their US Air and American Airlines examples. Despite the paucity of releases it is nice to see that the F70 and F100 moulds remain available for use. Both the QantasLink and especially the Mandarin Airlines examples have been really nice and I am surprised that there hasn't yet been a China Eastern example (surely it is only a matter of time)?